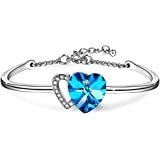 Amazon's Choice for "bracelets for womens gold"
 Design-Inspiration : This bracelets for womens represents the never-ending love. 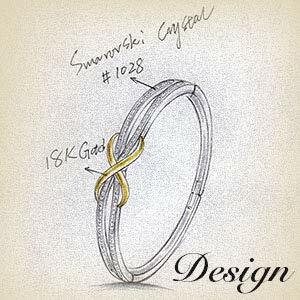 The meaning behind an infinity bracelet is actually quite beautiful - it symbolizes eternity, empowerment and eternal love. Infinity is forever, your love will last in infinity. Only love can be shared endlessly and last forever. The Infinity Symbol - Never the Love & Friendship, I Love You, "Always and Forever" Endless Love! 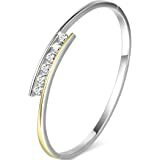  Features  :This bangles for womens is inlayed by a beautiful gold "8" infinity symbol and decorated with glittering white crystals from Swarovski to really make it stand out.With exquisite Swarovski element we create a unique design that should never be reproduced. ABOUT 7.1inch Fits different wrist sizes. 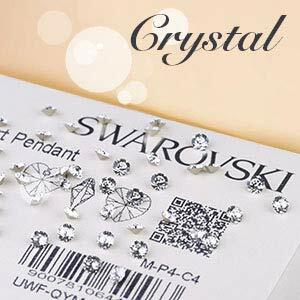  Materials and Specification  : A: Our infinity bracelet material all are environmentally friendly, not allergic, lead-free nickel, and pass SGS inspection; B: Swarovski is one of the largest crystal suppliers in the world, we bought the raw crystals from Swarovski and produced our own products. C: Exquisite polish and thick plated techniques, we create a unique design that should never discolor and will keeps stunning forever.  Ideal gift choice : The gifts for her bracelet comes in a pretty white gift box. Perfect as a simple romantic gesture, fits all ages. A perfect gift for your lover, wife, girlfriend, daughter, granddaughter or friends. Valentine's Day, Christmas' Day, Mother's Day, Holiday, Party, Anniversary, Prom, Graduation, Birthday. 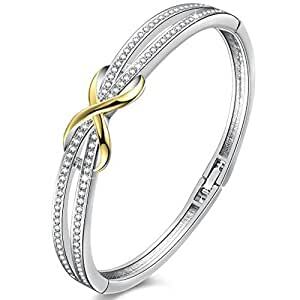 If you have someone with whom you are deeply connected, you can give her the infinity bracelet. "My love for you has no end".  Perfect customer service : ANGELADY is committed to providing the best jewelry and service to our customers. Your feedback is our motivation to improve. We look forward to your rating. 1 year product warranty, if for any reason you are not completely satisfied in 365 days, let us know, you can get a fast, instant refund. We are not happy until you are happy joining. Service email: angelady-uk@outlook.com. 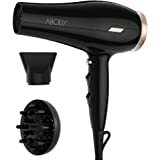 Sold by Angelady-uk and Fulfilled by Amazon. Gift-wrap available. 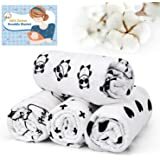 Sold by Angelady-uk and sent from Amazon Fulfillment. Sold by George Smith-Eu and sent from Amazon Fulfillment. 4. Specification: 0.71in, perfect gift for mother, wife, girlfriends and yourself. 5. suitable occasions: everyday life, office, wedding, party, prom night, going out, weekend, date ect. 6.Easy match with all kinds of clothes, bags, shoes and hairstyles. Angelady provides fashion jewelry with original design for every girls and ladies. You Angels,make this world a real paradise. Every piece of bracelet comes with a exquisitely designed gift box which make it a perfect gift choice. This bracelet is suit for(you can search this bracelets by the following words): mum bracelets, infinity bracelet, gifts for her, braclets for girl, swarovski bracelet, 9ct gold bracelets for women,silver bracelet, bracelet for girlfriend,gold bracelet for women, silver bangles for women solid 925, jewellery for women, bracelets for girls, ladies bangles, womans bracelet, white gold bangle, silver infinity bracelet, swarovski bangle, swarovski bracelets,gold bracelet, gifts for mum, knot bracelet, ladies silver bracelets, daughter bracelet, mum bracelet, ladys braclets, womans braclets, bracelets for mum,ladies gold jewellery, best friends jewellery for women, bracelets for mums,bracelet bangle silver,infinity jewellery for women,girlfriend gifts, diamond jewellery,womens bangles, infinity bracelets,mum bracelet silver, ladies magnetic bracelets,silver wedding gift, jewellery for best friend, ladies silver bracelets and bangles,swarovski jewellery women, wedding gift,gifts for women friends, women gift ideas,bracelets for girlfriend, friends gift,bracelets for womens mum infinity, magnetic pain bracelet, ladies gifts for mum,friendship knot bracelet,jewellery for women bracelets, 18th birthday gifts for girls jewellery, female gifts ideas. 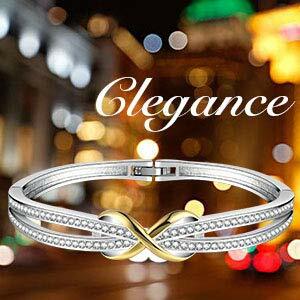 This is very fashionable bracelet，all the crystals clear and very shining. I love dual “ ∞” design. 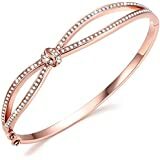 It comes in an elegant gift box，no wrapping needed，my gf would be happy with this bracelet looks really fancy as I have attached some pictures below just have a look! So happy to have this bracelet it’s match on my ring. It’s arrive so quickly. Very good quality. 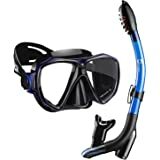 Now I can use it on my formal party next week so greatfull. I have attach a picture so you can see how nice is it when you wearing it... recommended. Stunning piece of jewellery. 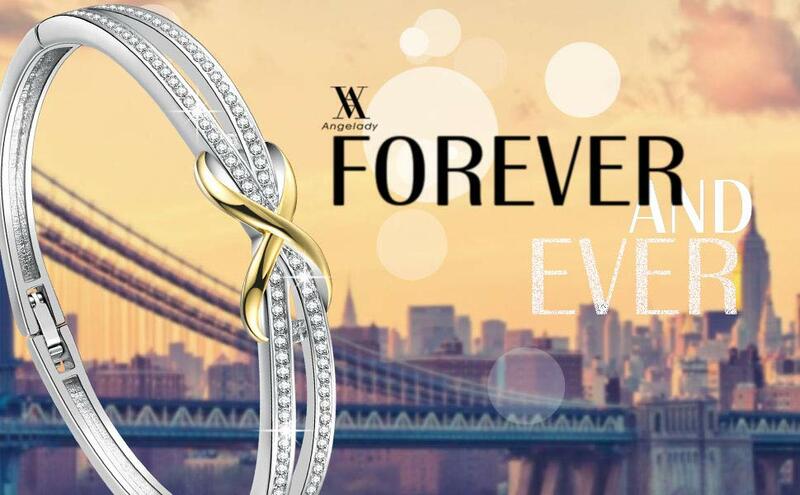 I love the infinity sign, sparkling crystals and the combination of gold and silver. It looks elegant and expensive. What is important is that I actually can fasten it without my husband's help! This can be a problem for these type of bracelets and the process can be so annoying, that the majority of stuff I've ever received as gifts or bought myself early or later ended up at the bottom of my jewellery box. This bracelet fastens easy but secure. Happy with everything. Recommend. 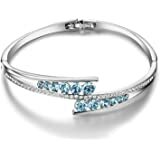 5.0 out of 5 starsFantastic Value, gorgeous bracelet! This is such a beautiful bracelet! I bought this as a birthday gift for my best friend to signify our eternal friendship. It come in a beautiful gift box and when you take out the bracelet it's so sparkly! It just glitters under light. Needless to say that she is delighted with the bracelet and I'm delighted by the great value as it looks much more expensive! 4.0 out of 5 starsNICE LOOKING BANGLE. 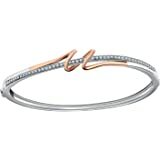 This is a lovely bangle which arrived in a lovely box and was well packaged. I bought it as a present for my wife for our anniversary. It is a very sparkly piece of jewellery and looks well made and sturdy. Love the use of gold and silver, looks very classy. 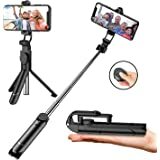 The fastener looks easy to use and the quality is good. Beautifully presented in a lovely gift box. 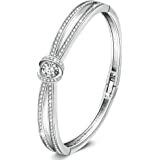 Really pretty, delicate bracelet that sits well on the wrist. Sparkles nicely and will complete an evening outfit. Clasp feels solid and strong - wouldn't be concerned it would break. Would be happy to receive or give this as a gift. Beautiful bracelet. Arrived safely and quickly in a lovely presentation box. The bracelet is sparkly with a gold infinity circle on the front and the back is solid with a small clasp fastener. The bracelet fits nice on my wrist as it is oval in shape which is good as my wrist is a little larger. The clasp is easy to do as well. The bracelet would make an excellant present. But on this occasion I am keeping it for myself.